Azerbaijan will hold the Nasimi Festival of Poetry, Arts and Spirituality for the first time on September 27-30. The festival, dedicated to the work of Imadaddin Nasimi (1369-1417), one of the brilliant poets and thinkers of the East, has been organized by the Heydar Aliyev Foundation and is supported by Azerbaijan’s Ministry of Culture. The program of the festival is full of bright events and interesting projects. 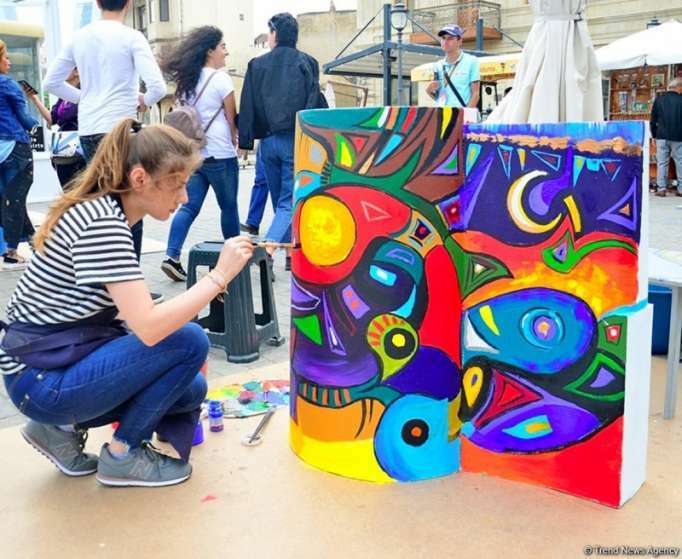 Participants of the 9th international festival of arts, Qiz Qalasi (Maiden Tower), held in the ancient part of Baku, Icheri Sheher (Inner City), on the square in front of the Maiden Tower have created the artworks reflecting Nasimi’s creative activity, philosophy and works. The Maiden Tower Festival has been held since 2010. The aim of the project is to promote in the world the Maiden Tower situated in the territory of Icheri Sheher, which is considered a symbol of Baku and was included in the UNESCO World Heritage List in 2000. Artists from different countries, participating in the festival, paint on dummies of the Maiden Tower. These unique artworks, which are demonstrated in various cities around the world, play an important role in the popularization of the Maiden Tower, which is a historical and architectural monument of Azerbaijan. This year 17 artists take part in the festival. They started painting on the models of the Maiden Tower with great interest, creating extraordinary masterpieces. The artists will paint on models in the open air for a few days. Their work attracts attention and delights passers-by, including residents of the city and numerous tourists. The event is held in a creative and friendly atmosphere. The participants are happy to talk about the themes of their artworks, and how they are inspired by the brilliant poet and thinker Nasimi. During the festival, programs will be organized in various places in Baku, as well as in Shamakhi, the native city of the poet.